The cottonwood seeds are floating in the air, which make it necessary to keep my helmet shield all the way down. Getting one of those fluffy white things under the helmet would seriously tickle, I mean, distract, in a not too good way, for one must drive or even ride, defensively while on a motorcycle. And, yes, we always wear helmets. Today we were gone about two hours on our yellow Suzuki 650. Dear Hubby gets the wide made-for-butts driver’s seat, and I ride behind him, legs at a 90 degree angle and squished up against his spine on my flat seat, which is 9 1/2″ long by 8″ (near the driver’s seat back) narrowing to 6″ at my 6″ x 8″ seat back. Before I ride and when I get off, I always do leg exercises. Even so, I sometimes cramp up when we ride too long at one stretch. He’s been talking for years about getting a bigger bike with a real seat for me, but I’m the one who hems and haws about getting another one. I rather like our little bike. We rode east along the Kalamazoo River and discovered a park built by Endridge Company when they spilled thousands of gallons of oil into the river in 2011, the largest inland oil spill in the nation at that time. 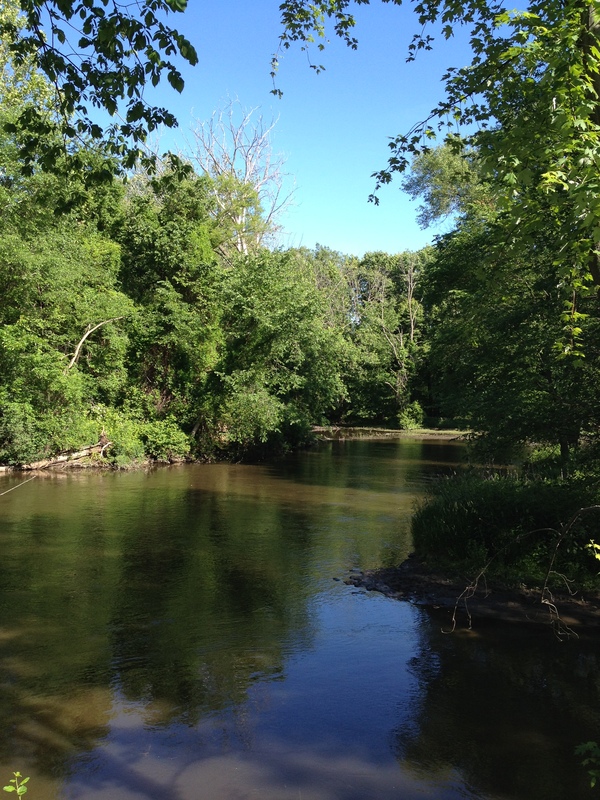 They created or enhanced about six small parks along the Kalamazoo in our area for good public relations. Sort of like what Rockefeller did for his PR after too many coal miners were dying in his mines. His advisors suggested he do a humanitarian project, like providing libraries for communities. So to replace all the death caused by the spill, instead of books, we get little parks next to our poisoned river. They say it’s clean, but just dig down 6″ into the river muck, and you’ll strike oil. At Paddler’s Park, we read a history sign that there used to be a dam at that point, forming a little lake. In the 1800’s, black bass and eel were four feet long. Fish in the river today are about five inches. There are also a modern canoe-kayak ramps in these little parks. The picture illustration show a man in a wheelchair sliding over the bench and getting into his kayak before rolling down the ramp into the river. Questions: How did the wheelchair bound man get his kayak off his truck-car to the launch? What did he do with his wheelchair after he got onto the bench? Obviously, it takes more than the single person in the illustration…right? There are many small farms still in this area of the country. There are old barns, half-covered with vines, and new one, freshly painted or made from metal. The corn in the fields is about shin high. The old expression for a good crop of corn is “Knee high by the Fourth of July.” Barring any hail storms or drought, these family farm fields look like they will make it. In June, besides the cottonwood seeds, there are also miles of roads covered with tunnels of maple, elm, and oak. We also were surprised to see two sand hill cranes still hanging about. One stretch of farm road had “Loose Stone,” which makes the road slippery for narrow-wheeled bikes; plus if you go the speed limit, stones can kick up and around and strike your back or helmet. Obviously, DH did a U-turn and we changed our route. 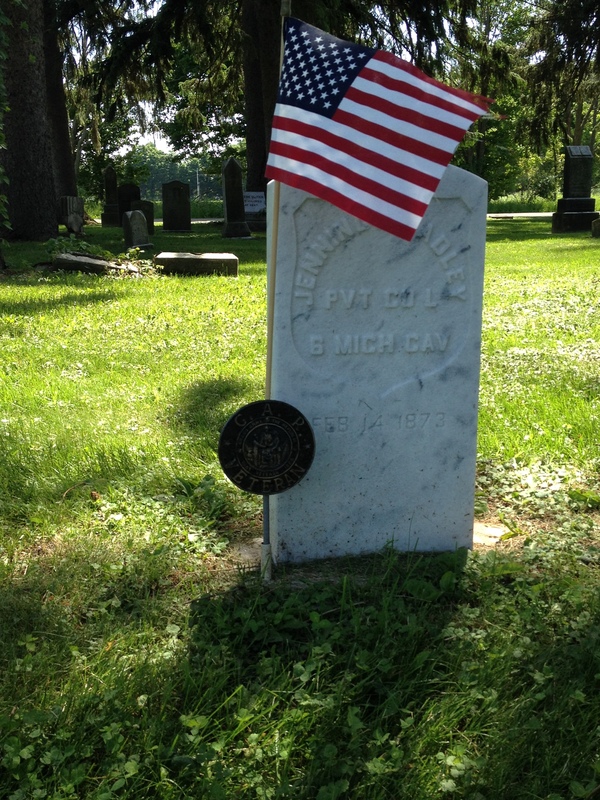 We rode west of town to small Roof Cemetery in Kalamazoo County. We often stop there. This time I wanted to explore the one corner we’d not walked before. 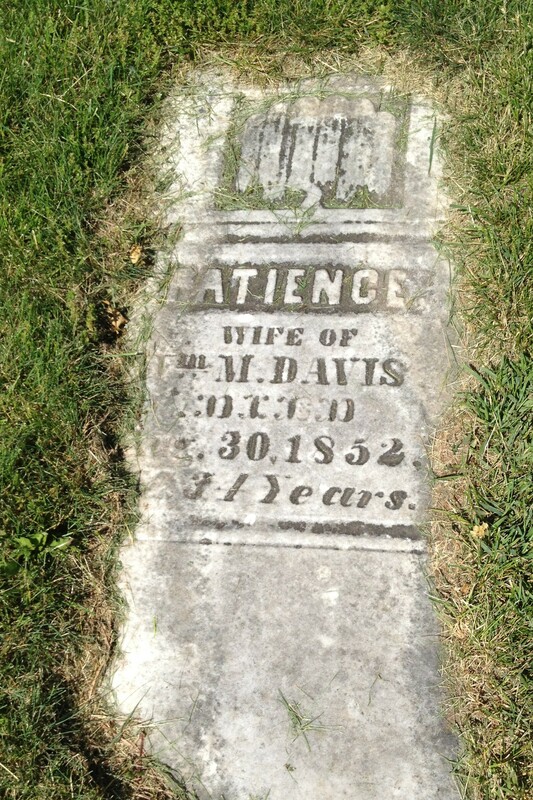 We found several tombstones of people born before the Civil War, with names like Emmet, Patience, and Liza. A few stones had GAR markers with American flags flying with it. We were surprised to discover a few people who had made it into their 90’s, and there were the expected babies and young children under 7 years old also resting there. 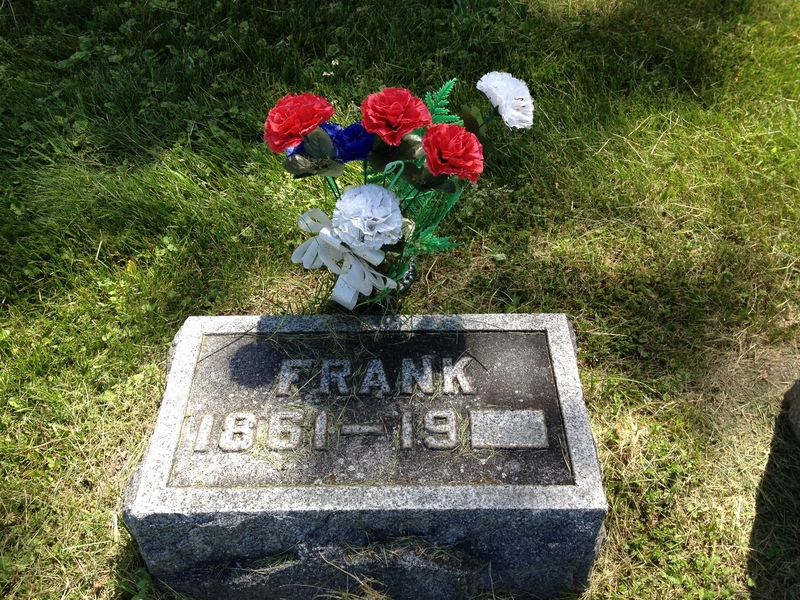 And then there was poor Frank who never died, but is still remembered with flowers. It was a reflective time for us. Big companies, river environment, family farms, and graves of those who died 150 years ago…maybe there are more reasons why we don’t ride in a club.